‘Tis the time to primp our porches in readiness for the happy, visiting hordes. At certain times of year, our attention is drawn to particular elements of the house and garden. In the last few weeks before and through Christmas to New Year’s Day, the focus swings to ‘first impressions’ – the front door. As well as more temporary titivations, is everyone happy with the general framework and functionality of what should be an architecturally welcoming space? 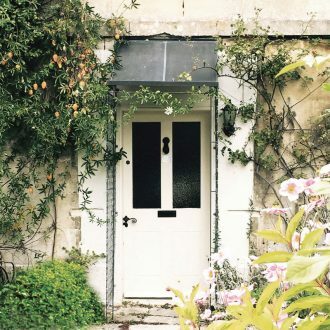 We’ll explore structural entrance-transforming options as well as some delightful decorating tips that bring the outside in and that will suit all types of property, heritage and modern. Speaking of front doors, as well as sheltering doorways and the postman from prevailing hail, a porch with a latticed side can be really easily decorated with lights or garlands in the winter time. A bright port in any seasonal storm. Garden Requisites iron porches are handmade canopies with sides that extend down to the ground. They sit so well with period houses – Georgian, Victorian and Edwardian buildings – and they also work with newer builds, lending interest to what might be more boxy, brick abodes. Each porch cover can be built to bespoke measurements with Hilary and team to hand to discuss fixings and installation. The care and attention to detail that goes into their ironwork construction makes these attractive additions very long lasting as well as weatherproof. They look particularly good with an inch or two of snow on them too. To get a better sense of the eye-catching possibilities, explore more doorway looks on our Pinterest porch covers board. Now to deck the doorway as well as the halls and yes, boughs of Holly are involved. At Garden Requisites we love to marry what’s in the garden with the house itself. In the summer this means possibly training roses and scented climbers up our wall trellis or planting up seasonal window boxes. In the winter, when porch climbers have died back to bare stems, as well as introducing the twinkle of outdoor fairy lights, consider simply using garden foliage clippings to make long, trailing garlands and a beautiful, natural wreath for the door. This really doesn’t cost much and ideal plants for the task are clippings from trailing Ivy, Conifers, Firs, Holly, Bay and even less traditional shrubs such as Pittosporum, Viburnum and Skimmia. Some like to keep their wreaths and garlands simple, some like to add zest by wiring in scored oranges, dried for a few hours in a low oven or gold/silver sprayed fruit such as pears and apples. Winter berries can also add a splash of festive colour. Place a couple of fine-looking fairy-lit clipped Box balls or pyramids in handsome pots and planters at either side of the door, in or by the porch and the scene is complete. Then pull your handmade festive foliage projects through into the house with fresh-smelling garlands around mantelpieces and leafy features on dining tables. Here are some more visual prompts for decorating doorways. Now then, the doorbell’s ringing. More merry makers. They’ll have to wait while we whip some more canapés out of the oven. At least they’re well sheltered from that rain!